Suicidal Maniacs and The Lady of Shalott follows Eliza, a young actor fascinated with The Lady in Tennyson’s poem. Acting as an art is fascinating, particularly as it’s now being problematized by reality TV. What or who is the real person in this heavily mediated world, and possibly nowhere is that question more pressing than in Los Angeles today where Suicidal Maniacs is set. And certainly the ancient mother-daughter story never gets old. In this book, readers will follow the story of Eliza, a young actor, who decides to play The Lady in a movie based on Tennyson’s story “The Lady of Shalott”. This decision makes her mother panic. Is this Tennyson’s or their family’s script, where generation after generation plays the role of suicidal maniacs? Everything is too close for comfort; with Shauna and Eliza’s family of five shrunk to two, the mother-daughter dyad must split apart, and it’s a bit like splitting an atom. The energy released can be explosive, though here it’s more vital than deadly. In Suicidal Maniacs and the Lady of Shallot, Morris has written a thought-provoking tale that will remind the readers of the truth that family represents tradition and not fate. And what people do with their traditions, rather than the traditions themselves, define their character. This novel contains poetry and treats poetry as a medium, intrinsically part of the story of everyday life that readers will find interesting and captivating. An excerpt from Chapter 1 is available here. 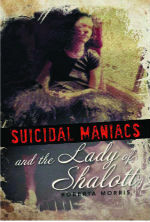 Suicidal Maniacs is available at Xlibris, Barnes and Noble, and at Amazon. Hello! Someone in my Myspace group shared this website with us so I came to look it over. I’m definitely loving the information. I’m bookmarking and will be tweeting this to my followers! Outstanding blog and terrific design and style. I’m so glad you’re enjoying it.